Linnaea grew up barn dancing in Upstate NY and became an avid contra dancer during her time in college near Utica, NY. She started calling five years ago in Syracuse, NY before moving to Seattle. With support and encouragement from many people in the dance community, she has had the opportunity to call in WA, OR, BC, VT, and NY. She has a healthy appreciation for traditional dances, which she learned in the North East, as well as a love of fun and interesting ones. This leads to a unique mix of new and old styles. Linnaea picks dances that she has enjoyed dancing herself and are accessible to beginners while still entertaining for experienced dancers. 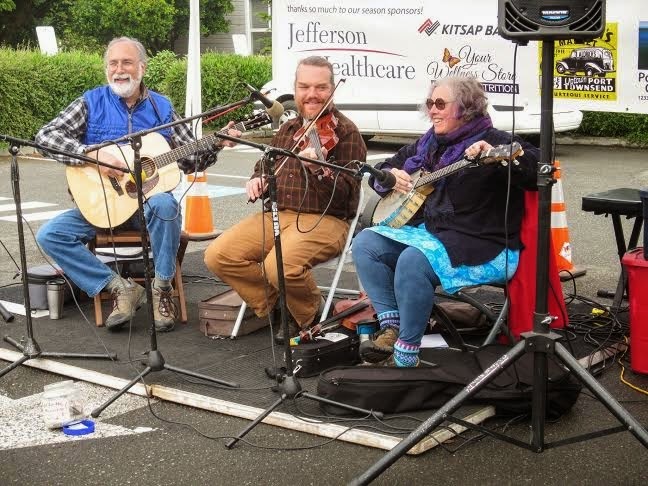 The Possum Carvers consist of Scott Marckx on fiddle, Jeanie Murphy on banjo, and Chris Cooper on guitar. (Some instrument switching goes on, however.) They have all been playing old-time music for a combination of years that probably comes close to the century mark. They have been known to be hijacked by a certain bunch of contra and French tune-playing folks known as The Glutton-Free Loafers. They look amazingly like Scott, Jeanie, and Chris. They all live in Port Townsend.